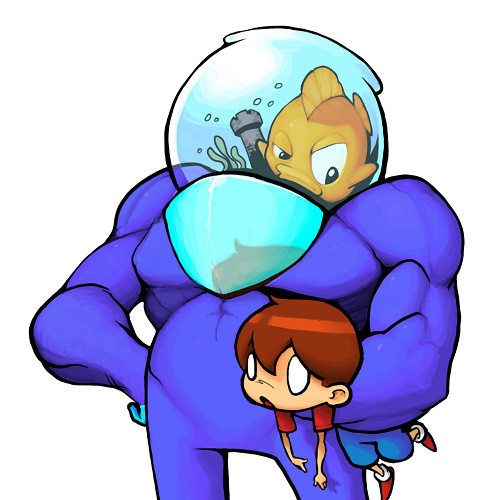 Flipper 2: Flush the Goldfish just got its release date for North America: 26th January. The one-button action game will set you back 500 Points. We interviewed Goodbye Galaxy Games about Flipper 2 recently. It's already available in Europe, so read our Flipper 2: Flush the Goldfish review for our verdict while you wait for next week. @Birdman13 well.. actually I'm doing you guys a favor! I save you alot of money! I mean who needs stupid Nintendogs when you can be the proud owner of a goldfish IN A ROBOT SUIT! Contra ? you can shoot with Banana's baby! And who needs a stupid kite attached to their kart when you can inflate yourself and fly around the world that way!? See ? Basically all you need is Flipper 2 and it will only costs you 500 Nintendo points! @HugoSmits: Hey...I never thought about it like that! Genius! I haven't downloaded this yet... will do so soon though. @LordJumpLz: I know, I felt like that too. But that's before I found out how comfortable it is to inflate yourself and fly around like that! @joevox316: I know, innovation is the key at Goodbye Galaxy Games! @Azikira: don't worry, i did my excited-happy-dance the other day when he tweeted the news, and i've got a little over $5 sitting in my eShop account for it. Can someone please tell me how many free blocks my DSi needs? That would actually be a nice thing to add to the game overview section of the reviews. Finally could bring myself to visit the DSiShop on Thursday and downloaded it. Not played yet though. @Fu-Sheng: It's 67 blocks on my DSi. @battLeToaD Thanks for the quick reply. Are the European games usually bigger in block-size, as they come with more languages to choose from or are US-DSiWare games as big as European games? I don't know how other developers do it, but for Flipper it's pretty much the same in size. All ingame text is always there, so the US version also has the german,italian,french,etc text in there.. you just can't select it (only Spanish and English). I do replace the manual though.. In the end it shouldn't really matter, the difference is really really small. @Fu-Sheng(14. ): Doesn't seem so from a short look. Hope these wikipedia entries for NA and PAL regions are right 'n' helpful. @LordJumpLz say hello to the future of transportation!